Great minds think alike, but all minds need to work together in order to benefit society most. There is no universal mind, no mind that it more desirable then others, no mind that can solve every problem, and no mind that can do everything. Some people have minds that more science-oriented, math-oriented, or arts-oriented. Some people have minds that prefer to be taught a certain way. Some people have minds that try extremely hard at certain things and some people have minds that certain things come easily. Individuals need to realize that the people around them do not have the same thinking process as they do. We have all been in that certain class, were you are sitting staring at the test in front of you and thinking that the test might as well be in a different language because it is that difficult. Then, the kid sitting next to you stands up and turns their test in because they are finished. In that moment you feel defeated, discouraged, and jealous. On the other hand, we have had that moment when our friend is doing homework and not understanding it and we peak over at it and say “that’s so easy…all you have to do is this…” Everyone is unique and people should understand that without a variety of thinking styles things would not be accomplished. 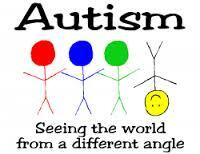 Individuals with Autism have a different perspective on life. 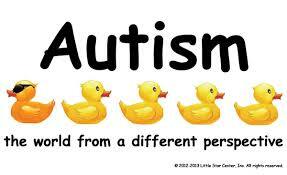 Although it should be known that all individuals who have Autism are not the same. Autism is a spectrum diagnosis and each individual is unique and has their own thinking process, within a thinking process that is already different from the norm. 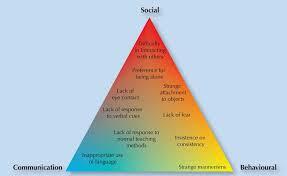 This image relates the social, communication, and behavioral aspects of life in the life of an individual with Autism. Individuals with Autism need to be inspired. They are often fixated on one thing, and this allows for motivation to learn more about things if the fixated topic is also included. 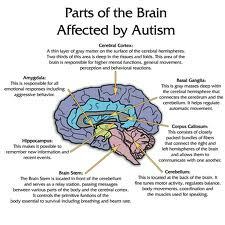 Individuals with Autism should be allowed to explore things, because most are visual learners and they can think about things in a certain way that others would never think about in that way. Society needs this type of thinker and learner to see things that are not abstract, but specific details. The phrase “hide it in blind sight” is truthful in this case because today people are abstract thinkers, but sometimes you just need to focus on the core and what is actually in front of you. Teachers should teach to inspire all types of thinkers to ensure that they are motivated and continue to want to learn.